I cannot claim to be an expert on Mexican Horror cinema so far, but I certainly intend to dig out more films of the kind of this gem. “Misterios De La Ultratumba” aka. 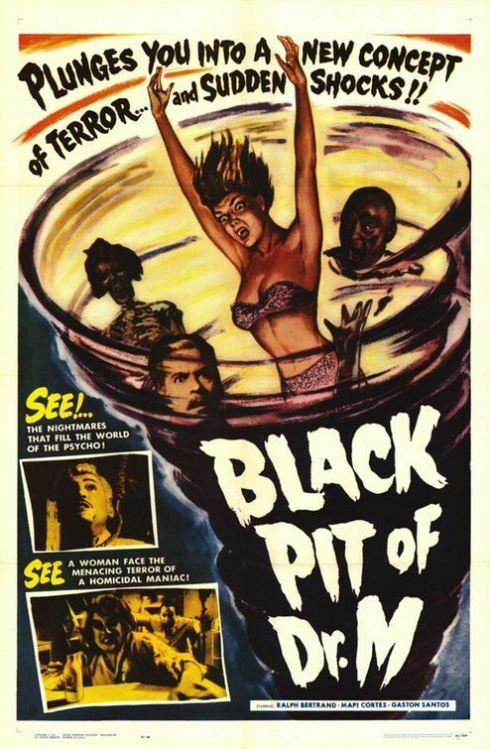 “The Black Pit of Dr. M”/”Mysteries From Beyond The Grave” of 1959 is an immensely moody Mexican Horror film that provides both a morbid and fascinating story and a genuinely creepy atmosphere. Occultism, mad science and the resurrection of the dead have always been some of my favorite Horror topics, and “Misterios De Ultratumba” unites all these elements in a very memorable and deeply uncanny manner. The atmosphere of this eerie gem is intensified by a haunting score, great Gothic settings and morbid makeup. Dr. Mazali (Rafael Bertrand) and Dr. Aldama (Antonio Raxel) have made a pact that the first one of them to die shall come back and tell the other the secret of resurrection. After Aldama’s death, Mazali, the head of a remote mental clinic, waits for the instructions of his dead colleague… This is only a very vague description of the plot, but I sure don’t intend to give any part of this creepy gem’s fascinating and wonderfully morbid plot away. The film, most of which is terrifically set in an old countryside insane asylum, maintains an intensely eerie Gothic atmosphere from the very beginning. The settings and visuals are great, old cemeteries and churches, heavy tombstones and foggy grounds provide the uncanny mood that my fellow fans of classic Horror should appreciate. The film provides morbidity, insanity and genuine scariness, all of which is intensified by the brilliantly intense and haunting score that boosts the creepiness each time it is heard. The performances are very decent, Rafael Bernard is good in the lead and Mapita Cortés is very nice to look at in the female lead as Dr. Almada’s illegitimate daughter. This was the first film by Director Fernando Méndez I ever saw, but it certainly isn’t going to be the last. Overall, “Misterios De Ultratumba” is an immensely creepy gem that no lover of atmospheric Horror should miss. Highly recommended!